For the price of the Iraq War, we could've given everyone in North America the same per capita amount in federal earmarks that Wasilla, Sarah Palin's hometown, received between 2000 and 2003. Earmarked funds have been widely criticized as a way to get excess spending past the controls in the appropriations process. Between 2000 and 2003, a period mostly including the last two years of Palin's reign as mayor, the city of Wasilla received $26.9 million in federal earmarks, including $15 million for a rail project connecting Wasilla to Senator Ted Stevens' hometown of Girdwood. 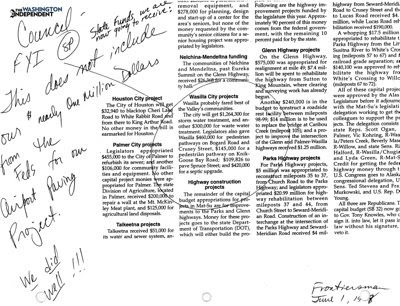 (The above image includes Palin's boasts about previous federal funding for Wasilla in her own handwriting.) In 2000, the population of Wasilla was 5469, so the city received $4919 per capita in earmarks. Earmarking this amount of federal funds for each of the 524 million people in North America would cost $2.58 trillion, which is less than Joseph Stiglitz and Linda Bilmes' estimate of $3 trillion for the cost of the Iraq War. Image from Mike Lillis of the Washington Independent.